This past spring the garden moved to the new property. We’re still in the process of renovating the house and working on cleaning up the property, and honestly, I had reluctantly come to the conclusion that this summer might be a good year to take a break from the cutting garden. With so many big projects ahead of us, it felt silly to take the time to put in a garden. I blurted this all out to Justin one afternoon to which he replied, “Can you use the old raised beds at the back of the new property? What can we do to make the garden less work for you this summer? Would an automatic drip system help?” Have I mentioned I’m married to the best man that ever walked the planet? No mention of the frivolousness of a cutting garden in the midst of the biggest project we’ve ever tackled; just him asking how he can help me achieve something that makes me happy. So I kicked things into high gear and got the long neglected beds cleaned out, while my fellas installed my new drip system. By the end of April all the seeds were tucked away, and all my dahlias transplanted to their new home. By the first week of July the garden was thriving. The automatic drip system needed a little tweaking; it took us a month to figure out exactly how long to run the drippers, and unfortunately in that time I lost all but one of my eucalyptus starts, and all of my Bulpeurum plants. Other than those two casualties the garden did well in it’s new home. I planted Cupcake cosmos for the first time this year and they started off beautifully! Unfortunately, the aphids got to them and they struggled after that. I’ve been growing cosmos for years and I have never… never had any trouble with aphids. I was totally surprised. I treated them with Sevin dust, which took care of the aphids, but the cosmos never totally bounced back and thrived. I continued to get some small blooms here and there, but nothing like the harvest I’m used to getting from my cosmos. The one thing I will remember about the summer of 2017 is the heat! We saw temperatures soar to 111 degrees, and streaks of 100+ degree heat that lasted almost 2 solid weeks. Even with consistent watering, that kind of heat is hard on flowers. This is what the garden looked like at the height of the season with everything in bloom. Every morning when I’d walk out to harvest flowers, the hummingbirds, bees, and butterflies would be swarming the flowerbeds! The purple/red foliage that you see in this next bouquet is Red Spike Amaranth. I always grow Amaranth but this was the first year I’ve grown the Spike variety. At first the color of the Red Amaranth was stunning; everything I’d hoped it would be, but as the temperatures soared the beautiful red color faded to a muddy green color. I was so disappointed! It’s hard to predict how heat will affect the color of a plant, and the only way find out is to try. Now I know, Red Amaranth doesn’t work with our hot summer temps. Next summer I’m going to plant Johnny’s Red Rubin Basil and hope it gives me the red/purple foliage I’ve been trying to obtain. This is the first year I’ve grown Feverfew and I am so in love with it!! It is the sweetest looking flower and it lasts forever in a vase. The only drawback to the Feverfew is it’s scent. It does have a slightly odd smell. Fortunately it’s not overpowering, and truthfully the smell doesn’t really bother me too much. Besides, I usually stick a little basil in my all my arrangements which pretty much covers up any other scent. I also planted Echinacea for the first time this summer and I love, LOVE it! The light purple flower you see behind the Echinacea, is Lemon Mint Monarda (which is a type of Bee Balm). I started the seeds in trays and transplanted them once they were big enough. I was surprised by how underwhelmed I was by the Lemon Mint. It’s probably just my personal preference, but I didn’t love it in any of my arrangements. I don’t think I’ll bother growing it again. There are too many flowers that I love, and I don’t want to waste garden space on something that’s just so-so. I finally had a gorgeous crop of Zinnias this year! I almost always loose my Zinnias to fungus but thanks to my new drip irrigation system they thrived all summer long. I planted both Giant Lime Zinnias and Queen Lime Blush Zinnias. Looking back that was probably overkill. I had too many greenish colored zinnias. In the future I’ll just stick with the Queen Lime Blush zinnias because they are dreamy! During the hot summer they’re mostly a bright green color with just a hint of blush in the center, but as fall approached and the nights got cooler the red tones really came forward! This is what the Queen looked like this fall. Aren’t those colors unreal?! Next summer my goal is to focus on my dahlias. This year my dahlias were okay but not as beautiful and bountiful as I know they can be. Because I got the garden in late this time around, I didn’t take the time to amend the soil like I usually do, and for the most part the flowers didn’t seem to mind too much. But that wasn’t the case with the dahlias. They need a little extra love, better fertilizer, and a better support system to keep them from flopping over and breaking at the base of the plant. I still got some beautiful buckets of dahlias! The Cafe Au Lait were stunning as usual. My Cafe was one of the few dahlias that I successfully dug up, divided and re-planted. For years I’ve only had one plant but now I have two healthy and thriving plants. I just love the look of Sage leaves tucked into my bouquets! They remind me of Lamb’s Ear, such soft, velvety textures. Next year I plan to expand my greenery selection once again. Foliage with interesting colors and textures are the key to a really interesting flower arrangements. And that’s the summer wrap up for 2017! Currently I’m working hard in the garden getting my beds prepped for spring. If all goes as planned this will be the first year that I will have a crop of spring flowers! I’m getting ready to plant Larkspur, Nigella, Ornamental Kale, Buplerum, Canterbury Bells, Sweet Peas, and Iceland Poppies seeds. I’ll try to keep you all updated on this new experiment So long from the garden my friends! This entry was posted in Imported on October 25, 2017 by April. I’m a creature of habit. I like the traditions we’ve formed over the years, and one of my favorites was taking our annual summer trip, and staying in the funky cabin near Pinecrest lake. I liked lounging by the lake, eating soft serve ice cream cones from the Snack Shack, hikes around the lake, movie watching under the stars,… I love it all and I never wanted things to change, ever. So when Justin suggested we try something new this summer I was hesitant (read: being stubbornly childish). Why mess with something that’s already so perfect? We found a nice spot at Clark’s Fork with a little creek that trickled by the campsite. The kids spent hours playing in that tiny creek. Finding things to float, wading around, getting muddy, building little dams. The boys had their own camping haven that they stocked with new comic books and flashlights. We had campfires each night with different treats to enjoy. The first few nights we did S’mores, but as a surprise, I also brought a bag of potatoes and let the kids roast them in the coals. We fished them out of the fire, smeared them with butter, and hit them with a good sprinkling of salt. I am here to testify that hot, slightly smokey flavored, coal roasted potatoes, are the best potatoes a person can eat. Period. Jude used our leftover baked potatoes to make fried potatoes for breakfast the next morning. By the second day, I must confess, tent camping in the Sierras had won me over completely. Sure, at night I missed the hot shower and sleeping on a real bed but…the fun and the memories were totally worth a little discomfort. Justin hung a hammock so he could stretch out and enjoy a little reading in the afternoon but Miss P claimed the it as her own personal swing. Grandpa and Grandma W. came up one of the days to celebrate Justin’s birthday and to do a little hiking and fishing. After such a wet winter the river was running very fast and it was hard to find a bank to fish from. Finally, after dinner we wandered across the meadow and found the perfect fishing spot! Grandpa W. was the only one who manage to snag a fish and sadly, it was a wee little fish so it got sent back down the river. So, a few things I learned: keep the kids warm at night! It’s way better to bring too many blankets than to not have enough. Even though the afternoons got hot, the temperatures really dip at night and cold kids don’t sleep soundly. Also, next time I’m bringing one of those solar shower units. Clark’s Fork is a beautiful campground but there are no showers. I found that I could handle sleeping on an air mattress each night, but man, I need a shower now and again. It turns out that renovating a new property while maintaining one’s current property, homeschooling, and keeping up with four human beings, can keep one busy and make a body feel pretty tired in the evening. Hence the big gap between posts. So, we will do the usual “pack it all in” approach and hope that I will find my writing rhythm soon! Here is the Cliff notes version of the last 4 (4?? yikes!) months. We’ve had birthdays, sitting around the communion table with dear friends, lots of hard gritty work, restful family trips to the ocean, spring flowers blooming, summer seeds sown, and a whole lot of everyday life. Miss E turned 8 this March! Grandpa and Grammy drove down from Oregon and spent the whole week with us! They camped off our back porch in their darling little travel trailer and we soaked up the time with them. Renovations on the new property are moving along a bit slowly but will be picking up speed now that summer is approaching. I will try to keep you all updated as I am able. Everyone has been so excited to see what has transpired at the house on the hill so I will try to be better about showing the progress. Do not mistake the well spoken words of another person for the voice of the Holy Spirit. I know that the Lord can use other people to convict our hearts or shed light were light is needed; but I sometimes think that all the voices, all the well crafted words, can become static that drowns out the one voice we should really have our hearts tuned to…. the voice of the Holy Spirit. He is a most steadfast guide, who knows the path our feet should take, ever ready to help, and filled with all wisdom for these confusing times. Trust Him, hear His gentle voice, and walk with the peace of knowing He is with you every step of the way; bringing you in contact with those who need you, and filling you with the strength and wisdom you will need on your journey home. This entry was posted in Home Life on May 7, 2017 by April. Christmas crept up on me this year, caught me a little off guard. Traveling over the week of Thanksgiving and being occupied with wrapping up school projects before the holidays, kept me moving and distracted. It felt so nice to close the books on school and just be together. The older the kids get; the more I appreciate having them around me. There were moments I was sorely tempted to panic (I don’t have enough time!!) or get frustrated with the kids (What on earth were you thinking?? ), but I worked really hard to put the breaks on those feelings this time around. I said to myself time and time again, “April, the best Christmas gift you can give them is to be a happy mom, to be excited and exuberant right alongside them.” This wasn’t executed super smoothly at times, but it was my goal. It wouldn’t be Christmas at our house if we didn’t make snowflakes for the windows, and destroy the kitchen making iced Christmas cookies. This is one of those cases when the saying “Many hands make light work.” doesn’t really ring true. Many hands make chaos…and fun. We got a beautiful tree this year. It stayed so green and it was the perfect size (the littlest member of the family was much kinder to the tree this time as well). This was the first year on record that I wasn’t gunning for the tree the day after Christmas. I got a new Christmas puzzle!! I’m slowly pulling the children into my Christmas puzzle obsession; they all took turns bending over the pieces and pawing through the puzzle box. This was the picture I snapped Christmas Eve night right after the children had gone to bed. I love this moment. They are asleep, breakfast is prepped and ready for the morning, everything is quiet, and I lay my head on my pillow thinking about the looks on their faces as they wake up and wander down the hall at the crack of dawn. The boys were up first waiting for their sleepy-headed sisters to wake up. Eliza’s doll Rebecca, got a fancy new dress from Grandma this Christmas and Eliza made sure Rebecca joined in on the Christmas festivities. Pearl and her crazy bedhead! She was still so sleepy and fighting so hard to shake it off for present opening. I also made a breakfast casserole but I didn’t give it enough time to defrost so it wasn’t quiet ready in time for breakfast. Lesson learned; big breakfast casseroles need more time to defrost! It tasted really good though! I think of all the gifts they got for Christmas their reading lights ended up being a favorite Lots of nights staying up late reading books they had gotten for Christmas. And that’s the big Christmas wrap-up. My second born son celebrated his 10th birthday the day after Christmas but that deserves a post of it’s own. Hopefully I’ll be back soon with a little post about my G and the ten years God has blessed us with our blue-eyed boy. This entry was posted in Celebrate, Home Life on January 19, 2017 by April. So here we are again, faced with a backlog of photos and another rambling post where I attempt to hold onto and freeze the days that are sliding by so swiftly. I know Christmas is upon us but I’m still sorting through pictures of pumpkins and autumn rain clouds. This Halloween we spent a quiet night in carving pumpkins, eating heaping bowls of pesto pasta, and watching old Disney movies. At first the girls were a little crestfallen when they discovered we wouldn’t be dressing up and going door to door, but a little face painting lifted their spirits, and they were absolutely delighted with the happy, glowing pumpkin faces looking so cheerful on the front porch. In the days following we did “pumpkin seed math” and roasted a big batch of pumpkin seeds. The sky has been magical these days. This westward view never gets old. This picture next makes me smile and needs some explanation. On a day to day basis the kids are responsible for keeping their rooms picked up. Most days they do a perfectly adequate job keeping the floor picked up, clothes in the hamper, and shoes in the closet. But once or twice a month I go in and to a “mom cleaning”. That means clean bedding, shelves get organized and dusted, books tidied and put in order, all the corners cleaned and vacuumed, and the beds perfectly made and smoothed out. The kids love when I do a “mom cleaning”. Their room is suddenly a haven again, everything “just so” and ready for play. They usually spend the remainder of the day in blissful, quiet play or tucked into their clean beds with a long lost book. School days continue to dominate our daily routine. I’ve decided that homeschooling the kiddos may be physically, and at times emotionally draining, but man is it keeping my brain sharp! The things I learn right along side them never ceases to amaze me and long after they leave the table I find myself googling things like, “The Black Hole of Calcutta” or, “American Whaling Industry” and “Whaleship Essex”. I also enjoyed a wonderful evening out with my sister-in-law Jessica. We took a flower arranging class out at Kelley Flower Farms. We made fall pumpkin arrangements from a sea of stunning flowers picked fresh from their own field, we enjoyed snacks and beverages, and grownup conversations. For the week of Thanksgiving we loaded the whole gang into a rented mini van and headed up north to spend Thanksgiving with my parents and Aunt and Uncle. After Thanksgiving we continued to drive all the way to Washington to attend a family wedding. I was born in the Pacific North West and going back always feels extra special. There is something so stunning about the land up North, I could have stopped a hundred times to take pictures but contented myself with an occasional phone shot from the passenger side window. It was so good to see my parents! It had been a full year since we had been up to see them. They live in the most charming little town, in a small 100-year-old house surrounded by huge old trees. They were so happy to see the kids! This was the only photo I managed to get of us all together. It’s far from perfect, but it’s the reality of letting other people take photos with your phone camera and dealing with multiple squirmy children. But the day after Thanksgiving we continued our journey to Washington. We played the part of the tourist in a small town by stopping for pictures next to the local landmark. My husband’s cousin got married that following Saturday. It was a sweet wedding and a treat to watch a young couple so clearly in love. We felt right at home as we met new faces that quickly felt like old friends. We also had the pleasure of having lunch with old high school friends! The wedding reception was held in a beautiful “barn”. They called it a barn but it look too lovely and pristine to be a working barn. I didn’t get a lot of photos of the wedding but I managed to snap this picture of the happy couple leaving the reception in the rumble seat of a vintage car! Such a beautiful evening and I’m so glad we were able to go! 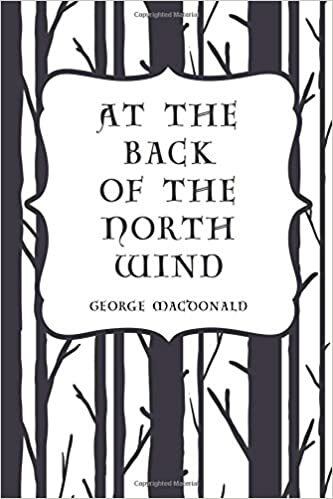 The whole time we drove we listened to George MacDonald’s book, At the Back of the North Wind. His stories are some of the most whimsical and fanciful books I have ever read or listened to in my life, and they stir my imagination in ways I didn’t know was possible. But what most captures my heart is the simple, yet powerful wisdom MacDonald weaves through every page in his books. I feel like I want to read them to my children over and over, and pray that a portion of that wisdom seeps into their very core. At the Back of the North Wind is the story of a little boy named Diamond who befriends the North Wind. To Diamond the North Wind is simply his friend who he loves and trusts, but the adult listener perceives that she is in fact death and suffering, sent to do the bidding of God throughout the earth. I know that might sound terribly morbid and not at all a children’s tale, but trust me when I say it is anything but morbid; it is a beautiful story filled with hope and love. This entry was posted in Home Life, Memories on December 5, 2016 by April. I’m still playing catch up on the old blog…hope you don’t mind! This September Jessica and I had the privilege of throwing a baby shower for our sister-in-law Angela. Angela and Elliot (my husband’s youngest brother) were expecting their first child this fall; a baby girl. My mother-in-law Mary, very graciously offered to host the shower in her beautiful backyard. Which was fitting, because almost 2 years earlier, Elliot and Angela were married in that same backyard. The stunning dahlias came from Kelley Farms, who spoiled me with buckets of amazing peach and cream colored flowers. I arranged them in simple sage and cream pitchers. We had feared a hot and still evening (as September evenings are known to do around these parts) but thankfully the night ended up being so pleasant. Jess had the idea of filling white balloons with gold polka dot glitter and having them floating around the party. I love how playful and sweet they looked. A few years back Jess and I went to a friend’s baby shower and en lieu of shower games they asked people to fill out a “Wishes for Baby” card. I loved the idea, and so Jessica went about designing this gorgeous card which matched the party invitations. Each one of the guests took a few moments to fill out the card for Angela to enjoy reading later, and someday hopefully her daughter will read them too and know how well she is loved by so many people! Because we knew it would be a warm evening we served iced coffee and ice water. The girls were so excited to be at the party and to wear their matching party dresses (naturally my daughters aren’t wearing any shoes). These girls have been eagerly awaking the arrival of a baby girl cousin FOR EVER. Little miss had celebrity status even before she was born! Lest you are under the mistaken impression that they are little ladies. And here they all are with their (and I quote) “favorite Aunt”. We served strawberry, and Nutella mouse parfaits with a layer of sweetened pretzel crust; along iced oatmeal shortbread cookies, cream puffs, salted almonds, and fresh fruit. I think the girls ate a dozen cream puffs each. Miss E ended the night with a terrible stomach ache (silly girl). Friends and family began to arrive as the sun started to set. It was also Jessica’s idea to swag lights behind Angela to provide a some extra lighting after dark. Aunt Angela had lots of helpers at present opening time, more than she needed that’s for sure Happily I can now report that sweet little baby girl has arrived, she is healthy and beautiful and so well loved! This entry was posted in Imported on November 3, 2016 by April. This past July, over the week of Justin’s birthday, we loaded the minivan up and headed to the Pinecrest cabin. We’ve been so fortunate to be able to rent the same cozy cabin for 4 summers now, in fact it hardly seems like summer if we don’t make it to the lake! I packed all the really important things for myself, library books, embroidery, and of course flowers from the garden. We woke up the first morning on Justin’s birthday. He got up early to make us all a special breakfast. Of course it wouldn’t be Justin’s birthday without homemade berry pie. The next morning Grandpa and Grandma Wolfe, Uncle Jared and Aunt Jess and the cousins came up to spend a day on the lake with us. She loved the water, but every once in awhile the coldness of the lake would catch up with her, and she’d need to spend some time bundled up in beach towels. We brought everyone back to the cabin, threw kids into tubs and showers, and got everyone changed into clean, dry clothes. The men went to pick up pizza and we enjoyed a fine night filling our bellies with good pizza and watching the sun set behind the trees. The cousins headed back down the mountain but Grandpa and Grandma W stayed the night and spent most of Monday at the lake with us again. We spent our whole vacation lounging at the cabin or the lake. Normally we try to take some hikes but on the very first day of our trip, Miss E got a bad blister on the back of her heel, and G ended up leaving home with only flip flops…so hiking was no longer an option. Is there anything better than soft-serve Snack Shack ice cream cones? The last night of vacation we packed a picnic dinner. We swam at the lake until late, and had a small BBQ while we waited to watch a movie at the Pinecrest, Movie Under the Stars amphitheater. We took a moment to snap a few pictures of kiddos. I love those happy sun-kissed faces! We huddled together eating popcorn and watching The Secret Life of Pets (which was a big hit with all the kids). When the movie ended we loaded sleepy kids up in the van, headed back to cabin to throw our luggage in the car, and took the long drive back down out of the mountains. Another beautiful summer by the lake. Another year of fun in the funky cabin. This entry was posted in Imported on October 23, 2016 by April. I cruelly left my last post with a big teaser and then promptly disappeared for nearly two months! It wasn’t intentional but sometimes these things do happen. Anyway, the big news is we’re moving! But not to worry we aren’t going far. Just next door in fact. This past July we signed the papers to purchase the three acre plot next door to our property. It features a one-hundred-year-old, charming house that is perfectly situated on top of a hill surrounded by trees, it also has a very large shop, a gorgeous view off the back of the property and… lots of junk. So much junk; inside and out and all over the property. Did I mention that it happens to be the neighborhood eyesore? But nothing that a lot of hard work won’t fix. Really if you can look past all the abandoned cars and piles of rubble, it’s a gem of a home and the sweetest little setup anyone could ever wish for. It’s on a hill for crying out loud! For those of you who aren’t familiar with our area, we live in a giant valley. It’s flat everywhere. When I drive over the freeway overpass my kids get excited, that’s how flat it is around these parts. Needless to say we have a lot of work ahead of us and we alternate between feeling so excited and feeling so overwhelmed. But I thought I’d give you a brief tour of the house (soon I hope to post pictures of the property and shop). These picture s were all taken over a month ago so things have already changed but for now they will have to do! So, lets begin with the font door. You walk in through this charming front door which I’m hoping to keep and paint a fun color (maybe yellow?). I like all the carvings and the oval glass; I think it really fits the house. This is the view you are greeted with; the living room area and a view of the staircase. The doorway at the bottom of the stairs leads to a small bedroom, and the doorway to the right of picture is the downstairs bathroom. There was a lot of stuff left in the house when the previous owners relocated. If you can believe it these pictures don’t show half of the stuff that was left behind. Still standing at the front door, if you look to your right, you will see what will eventually be our dining area, the kitchen, and the walk-in pantry. The kitchen was gutted before we took over the house; it was an edition that for some reason includes an indoor fire-pit?? As much as the boys are lobbying to keep the indoor fire-pit I think it will be one of the first things to go. Obviously we’re starting from scratch here in the kitchen (actually every room in the house is from scratch) so there are a lot of big decisions to make here. Because the home is older and has a farmhouse feel to it, we’d like to keep that look as we update the whole house. That is the side door that leads out to a rundown garage. The very large, convenience store fridge has since been moved and the entire kitchen is empty. This is the downstairs bathroom, which the previous owner had begun to redo but hadn’t made very much progress by the time he decided to move. It’s decent sized but long and narrow which is proving to be a little challenging as far as layout is concerned. This is the downstairs bedroom that is right off the base of the staircase. Initially this room seemed like it was in the best shape and would require the least amount of work but as we were taking out the flooring we noticed some water damage behind the bead-board so all of that had to come down. The kids love this hand-carved heart light switch so I think it will stay. Here we go up the narrow staircase. Directly to the left of the stairs is the very large,and very scary upstairs bathroom. This is a space that has loads of potential but it’s going to take a lot of work to unlock that potential. While the bathroom is large, the huge window and low ceilings are tricky to plan around. Where to put the shower, and the vanity, and the mirrors? How do we create and maximize much needed storage? The large picture window will have to go. Who puts a giant window in their upstairs bathroom anyway?? We’re kicking around the idea of dividing this room in two, but we’ll see. From the bathroom you can see the length of the upstairs hallway. Sections of the hallway walls were removed to install builtin storage. Those will need to be designed and installed. This is the largest bedroom in the house and was meant to be a master bedroom. Justin and I considered using it for our room, but it’s not connected to a bathroom and it’s upstairs in “kid central”. In the end we decided to have the girls share this room. There are a lot of skylights in this room, which are sort of nice because they let more light in the room, but they create a LOT of heat for a westward facing room. Still trying to decide what we want to do with the skylights. Directly across the hall is a second bedroom that will become J’s room. It has a small closet and a window that faces east. I love the charm of the upstairs bedroom. All the cozy nooks and corners. At the end of the hall is the third and last bedroom which will be G’s room. This window faces the front of the property. The upstairs bedrooms are all in pretty good shape. Painting, framing the windows, and adding trim are the extent of the work that needs to be done to those rooms. Heading back downstairs there are three doorways at the very center of the house. The middle door leads the back the house. I love this little builtin cupboard and I think it will look really nice painted. The shelves are shallow so it’s not practical from a storage stand point but they add character (which is important!). I think this back room was at one point the kitchen, but we’re going to use it as a laundry room/sewing room. At first I wanted to keep some of the cupboards but as we started really looking at them, we realized they aren’t quality cabinets and rodents had been living in them for the last year….so out they came. This is the same room looking out to the hallway that leads to the living room. The ceiling is paneled with old wooden drying racks and I actually really love the look. I’d like to take them down and give them a little TLC, maybe some whitewashing before we rehang them? Maybe I’m crazy but I also like this lamp shade. I think I could work with it; do a little paint and fabric makeover. Most of the doors and hardware seem to be original to the house and I’d like to keep as many of them as I can salvage. Sorry this next picture is so blurry, it was getting steadily darker and my camera was having trouble focusing. This is another hallway that connects the “sun room” to the rest of the house. The sun room is and addition to the house and is in rough shape. It’s got potential but it need so much work inside and out. We’d like to eventually convert this into a master bedroom/bathroom suite but for now Justin and I will use the small downstairs bedroom. I love the beams and the vaulted ceiling! I think this could be a really lovely master bedroom with nice windows and a little sitting area. Some place tucked in the back house to provide a little peace and quiet. And that’s the house tour for now! I can already tell that it’s going to be a challenge to keep up with the house progress but I will try to be better about doing house posts (posts in general!). Thanks for coming by, for your patience during quiet times here on the ol’ blog. This entry was posted in Imported on September 29, 2016 by April. But finally, at long last your birthday arrived. Daddy woke you up early and took you to breakfast. You had a hard time shaking off the sleepiness while you ate your special pancakes. When you got home from breakfast I had all your presents wrapped and waiting on the coffee table so you would see them right when you walked in the door. We let you open a few small presents right away, and saved your bigger gifts for after dinner when Grandma and Grandpa W. would arrive. You gasped and clutched your Hello Kitty chapstick rings, and positively beamed when you opened your very own bag of Jelly Beans. Your Daddy glanced over at me and said, “Sheesh, were there no small bags of jelly beans at Target?” I just grinned sheepishly and shrugged. We filled up the pool and you spent nearly all day in your swimsuit. Your were a generous little soul and shared your jelly beans with big sis. The next important thing on the to-do list was the cake. You had been talking about and planning your cake for months! We bought large and small gumdrops from the big bins at the grocery store. We fished the tiny cookie cutters out of the big box of cutters and you and your sister helped me roll out and make little gumdrop flowers. We made gumdrop mushrooms and gumdrop grass,and especially gumdrop carrots. The gummy carrots and frogs were by far your favorite. I made semi-homemade pizza (thank you Trader Joe’s for your yummy and inexpensive pizza dough! ), because pizza is still your favorite dinner. After dinner you finally got to open the rest of your presents. We sang Happy Birthday loudly and you suddenly got a little shy. The chocolate cake was enjoyed to it’s fullest, and got spread from ear to ear. We love you darling girl, you make us laugh everyday with your goofy smiles and funny phrases. This entry was posted in Imported on August 5, 2016 by April.